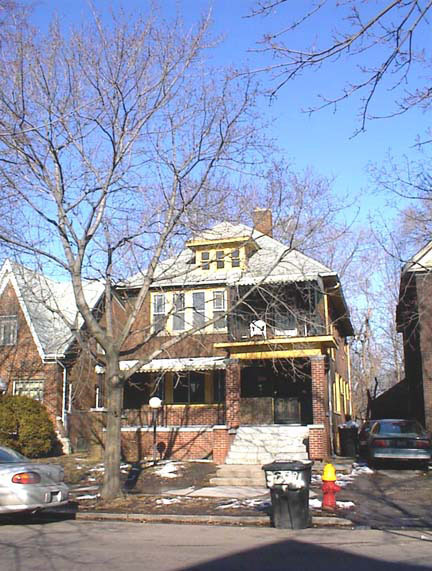 This is one of three Detroit homes linked to the long fight of African Americans to obtain equal opportunities in the city's housing market. The Orsel and Minnie McGhee home at 4626 Seebaldt is the most well known since litigation about its restrictive covenants eventually led to the Supreme Court's 1948 decision overturning the enforcement of such racial restrictions (Shelley v. Kraemer, 334 U.S.1, 1948) And Dr. Sweet's nearby home at 2905 Garland led to the nation's most important racial trial of the 1920s. Walter Stowers was born in Detroit just before the Civil War in 1859. He became a writer, political activist, civil rights pioneer and a barrister. In the late Nineteenth Century, he helped establish two black newspapers in Detroit. The first was the Venture, but it did not survive for long. In 1883, he co-founded and then co-edited the Detroit Plaindealer, which was published for 11 years. In 1894, he and William Anderson wrote and published the novel, Appointed: An American Novel. Because it dealt with the controversial topics of black-white personal friendships, lynching and segregation, he used the pen name, Sanda. Stowers' involvement with the Michigan Republican Party was rewarded with his appointment as Deputy Sheriff of Wayne County in 1886 and Deputy County Clerk a dozen years later. In 1922 he was elected to the Wayne County Board of Supervisors. This was in the era when the Republican Party successfully recruited the votes of African American in many northern cities. During and after World War I, restrictive covenants were commonly written into property deeds in Michigan and elsewhere as white developers and property owners sought to exclude minorities. Stowers led the fight against restrictive covenants, arguing that the Fourteenth Amendment and the Civil Rights Act of 1866 prohibited them. The first litigation that Walter Stowers carried to the Michigan Supreme Court was the Parmalee v. Morris (218 Mich. 625, June 5, 1922) litigation concerning a black couple, Charles and Anna Morris, in Pontiac who purchased a home in a development with a restrictive covenant and then moved there. Other property owners led by plaintiff Parmalee sued to have him removed because of the restrictive covenant. Michigan's Supreme Court in an 8 to nothing decision concluded that restrictive covenants were not state actions of racial discrimination that would violate the Fourteenth Amendment. Rather, they were private agreements among owners of personal property and thus not prohibited by the Fourteenth Amendment. Four years later the national Supreme Court agreed with this view in Corrigan v. Buckley (271 U. S., 323, 1926). The second litigation he carried to the Michigan Supreme Court involved a prosperous Detroit black couple who, in 1925, purchased a property on the far east sideLakewood Avenue in the Oneida Park subdivisionand then erected an expensive home there. The wife, who purchased the property and did the negotiations, was very light skinned, so the developer probably did not realize he was selling to a non-Caucasian and may not have completely explained the restrictive covenant. However, when the home was finished and the family moved in, neighbors realized that the couple was black, so they sued for their removal. Stowers raised a variety of technical issues, along with the Fourteenth Amendment argument against restrictive covenants, but the state Supreme Court again ruled unanimously that the restrictive covenant should be enforced. Because of the way the covenant was written, the Supreme Court ruled that the black couple could own the property, but not live in it (Schulte v. Starks, 238 Mich. 102; April 1, 1927). I have seen written statements reporting that after Walter Stowers purchased the home you see at 4180 Burns, the white neighbors sought to evict him. He once again went back to court and won his right to remain in this home. I cannot, however, find convincing documentation of this litigation. Walter Stowers died in Detroit in 1932. This is no State of Michigan historical marker at this site.